Everything is sweeter during harvest time. I had mangoes for lunch today, and they came from a tree just a few minutes away. Might be the best I’ve ever eaten, and it’s true what they say, you have to savor the fruit when its in season. Here in the Dominican Republic, everything grows, and everything has its harvest time. The way the Dominicans say “zafra” (harvest) around here makes the word sound like it describes a festival where the whole town celebrates with music, dancing, and delicious food. But for the majority of Dominicans, “zafra” really just means “employment.” When food is ripe, it can be gathered and sold, and there is income. Certainly, this is something to celebrate. I’ve been celebrating the rains that have come. Sure, it brings an extra bump in humidity amidst the temperatures of the high 90’s, but wow, when the rain comes, the wind sweeps through the house where I’m staying and it’s more refreshing than air conditioning. I’ve always loved the rain, and this is just another reason to add to the list. I’ve realized though, that not everyone shares my affinity for it. 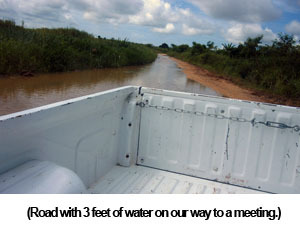 Rain, in a developing country can make it impossible to do business or travel anywhere. Traffic jams are horrendous, and for some of our branch offices, our community bank meetings are unreachable because of the damage done to roads. (Check the picture to the left to see a road that’s covered in 3 feet of water. We had to drive into the brush to make it to the bank meeting.) Coincidentally, in the sugar cane communities, the rain marks the change from “la zafra” to “el tiempo muerto” (dead time) when harvesting is finished until November. I think this is a lesson in perspective for me. While I can experience the joy of cooler winds, others know that great rains bring great pains. I live on the second floor of an apartment in the capital city. There’s no dirt floor for the rain to mix with mud, and my windows are made of glass instead of sheet metal with ropes of twine as hinges. 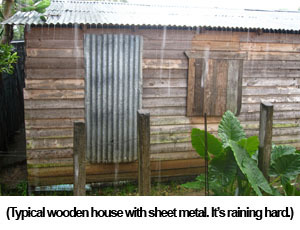 When I hear the rain it helps me sleep, but when I’ve talked to clients of ours, they talk about the pounding of the rain on their metal roof homes. For a family sharing one bed in a one room house, the children cry and the parents try to console them back to bed as the thunder and monstrous rain destroy a peaceful night’s sleep. The arrival of the rain brings many lessons and new perspectives about the nature of overseas missions work and the kind of perspective I bring to it as a Westerner, or more aptly named, an Outsider. I’ve realized that as I make my way through these communities doing the work of HOPE, I enjoy everything I learn about the culture. But, I am an observer, I am not a participant. 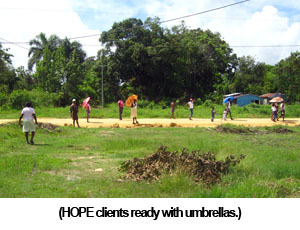 As a volunteer with HOPE, I am not a client of HOPE. I am independent of the local economy; the rise and fall of gasoline prices and their effect on local prices have no consequence to me. How much food I can buy to eat does not depend on the amount of money I make from customers that stop by my stand in the market. Here, on rainy days, people don’t go, or wait to go to the market later in the week. These small changes in consumer behavior can be crippling to the people at the bottom of the economic chain. So when I speak of rain, I speak about it cooling down the humid nights, I don’t speak about it delaying a delivery of goods to my business, or preventing customers from buying my goods which helps to feed my family. I guess I’m learning more to listen, not just to differences in our cultures, but more to the reality of daily living for the clients we serve. 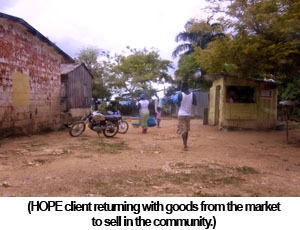 Even in the sense of trying to practice sympathy with a client’s plight, they want you to know that even though the rains come and business is slow, the Lord is still faithful, and He will provide. Taking into consideration some of the stories I’ve heard, I could conclude that rain’s destruction is overpowering, but I am reminded daily by our clients, that even the rain has a Master to answer to. Every time I think about the benefit or a problem of something like the rain, I find that there is a greater meaning to it and a breadth of topics that follow. It is becoming clearer to me that we can all approach experiences in dramatically different ways. Which brings me back to mangoes. Mangoes are the sweetest right now. You can’t argue with that. You can find them just about everywhere in the markets. 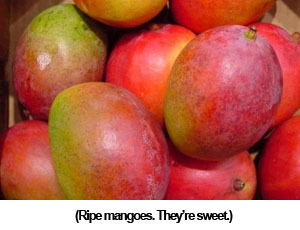 But if I were you, I’d ask a Dominican to buy the mangoes for you. You may think that the grocery store has the best mangoes, but honestly, the locals know who’s got the best deal in town and where you can find the freshest delivery. You may think mangoes arrive in cardboard boxes and get stacked in nice neat piles in the fruit aisles, but you might not realize that there’s a mango tree near your residence. You may think that you’ll need a ladder and gloves to get the mangoes, but they can show you how to knock them down with a well-thrown stick. This entry was posted in Monthly Newsletter on June 28, 2011 by Aaron.